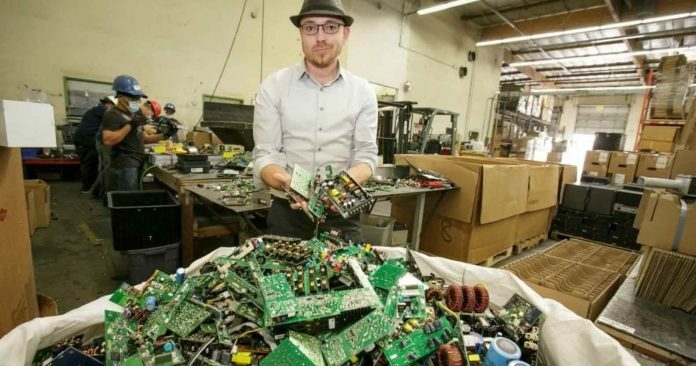 A California computer hardware recycler is likely going to serve prison time for attempting to extend the life cycles of old computers. Eric Lundgren, an innovative computer engineer, may have to spend 15 months in prison for saving the environment and recycling computers. Even though Lundgren has a successful computer recycling business, the thought of throwing away or destroying so many PCs was unsettling. So he hatched a plan to copy and sell to refurbishers PCs with Microsoft restore discs. However, when the company learned what he was doing, they tried to put him in prison. Piracy is a crime and affects the bottom line profits of video game manufacturers, Hollywood films, and software companies like Microsoft. But a Microsoft restore disc is included when someone buys a computer and is available as a free download when someone can prove their product key for Windows belongs to them. But for people who buy a second-hand computer, if the product key to the copy of Windows does not belong to them (registered with Microsoft) the computer is worthless and must be thrown away. Equally disturbing to Lundgren was the fact the free restore discs, included with a computer’s purchase, often get lost by the owner, thrown away by a company, or simply misplaced. That easily comprehensible act of negligence made Lundgren’s job of wiping a computer’s hard drive and giving it a fresh installation of Windows nearly impossible. Only with a fresh reinstallation of the operating system could the computer be sold in good faith to a new user. He intended to sell them to other computer recyclers and not to the general public for $25 each. Remember, Microsoft gives the product away, but proving ownership of the operating system is difficult if not impossible to do, especially if the product’s key code is invalid or not registered to the new buyer. Even though Lundgren never sold a copy of the “restore” disc, its manufacture bypassed Microsoft altogether and allowed for recyclers to quickly offer for sale quality computers who still had a lot of life left in their systems. Lundgren lost in court and was at the moment of surrendering to the prison industrial complex to serve out his 15-month sentence when his case was accepted at the 11th circuit court of appeals. “This case is especially difficult,” Hurley told Lundgren at his sentencing last May, “because of who you are today and in terms of who you have become.” The judge received evidence of Lundgren’s recycling company, IT Asset Partners; his projects to clean up e-waste in Ghana and China; and a 2016 initiative in which Lundgren’s company repaired and donated more than 14,000 cellphones and $100,000 to the Cell Phones for Soldiers organization to benefit U.S. soldiers deployed overseas. As it stands, people who buy computers which do not have a working copy of Microsoft Windows installed will have to pay Microsoft for a new copy, an action which usually costs more than the value of the old computer. Doing so is pointless. In fact, a person should just go ahead and purchase a new computer at a big box retailer, instead of paying the same price for an old, used computer. This is precisely the problem Lundgren attempted to solve. Even though the software is free at the time of the original sale and free for download, the mega-company will prosecute anyone who attempts to profit from their free downloads. Lundgren will likely do prison time if the 11th Circuit Court of Appeals does not rule in his favor.